In Canada, long term care is required for seniors and others needing access to 24-hour nursing care and daily support services for an array of physical and/or cognitive conditions. Long term care residents are assessed, and deemed eligible, by social service agencies run at the provincial level. People in the later stages of dementias such as Alzheimer's are among those who require this level of care, as well as those with physical or behavioral problems that render them dependent. In general, long term care is the proper solution for those assessed by medical professionals as needing constant monitoring, nursing supervision or other highly specialized care that cannot be met in their own homes, or by other health services. In select regions throughout the country, there are often waiting lists for these facilities. Provinces across Canada, including British Columbia, Albert and Ontario, fully fund medical and support services in long term care. Residents are responsible for paying accommodation charges. People assessed by a medical professional as having complex care needs that cannot be met in their own home or by other housing and health services are eligible for long term care. This offers a protective environment staffed by medical and nursing professionals. Long term care (sometimes abbreviated LTC) will often include a personalized plan of care prepared for each resident. Clients in care receive 24-hour nursing and personal care, with access to a physician or other health-care professionals. Facilities are dedicated entirely to detailed care and are secured for optimal patient safety, medication administered by trained staff and a number of other high level features. In a number of regions across Canada, waiting lists can be months or even years long. Those in need can avail themselves of other care while they wait, including memory care facilities or assisted living facilities. In some cases, long term care is offered in the same residence or retirement community as other types of care lower on the care continuum. Various short-term stay programs are offered by retirement homes listed here. In the case of seniors who find themselves in deteriorating mental or physical health (or both) or with increased medical needs, there is a process for determining whether or not they need to be committed to long term care. Family members, along with the senior (as long as he or she is able), will consult with medical authorities who decide that you qualify for publicly subsidized residential care services. With this assessment, your clinical care requirements will be determined and laid out, including specific nursing care, assistive facilities and other needs (see below). You are then referred to a government health service (such as the LHIN in Ontario, or BC Health Services in British Columbia) for coordination. It may be determined that there is a specific facility that best meets your needs, and you are able to move right in. On the other hand, families may need to look around at what is available, take tours (strongly advised), and decide on their own preferences. In many cases, room is simply not available, so the patient is put on a waiting list. You need to check out homes in advance and decide for yourself what is best for you and your loved one. As some authorities caution, government agencies will, in fact, pressure you to accept what they offer. Know what you want and be willing to wait for it. Don't bow to this pressure without consideration. It's better to stand your ground and to ultimately wait things out to get a home that is acceptable to you. Your parent could be there for a very long time, so you want to make sure that you made the right long term decision. Look ahead and create a nursing care plan for dementia that helps you make the best decision in situations like this. Read reviews of retirement homes to find the best place near you, before you choose any community. Long term care facilities (sometimes called continuing care) are limited by space, number of beds, staff shortages and other factors. Because of that, there is a wait time in many areas of the country – to get into any facility in some areas, or certainly to get into the facility you prefer. If you are offered a bed in a facility that is not your first choice, you may choose to accept it, then wait for a transfer. Home care services, adult day programs and other programs are solutions that can help alleviate the needs of seniors who may have deteriorating health or suffering from dementia. You may be able to hire 24-hour care as a means of waylaying the need for long term care. While these services do not provide a full solution to those who have been assessed as having long term care needs, they offer help, therapies and detailed care. Short-stay programs, while you wait. For those requiring more extensive care than that, for-profit retirement homes offer a number of solutions, including trial stay programs. Homes listed above tend to specialize in these types of offerings for families waiting for long term care. Programs may be costlier than government-backed long term care, but these solutions will be tailored to the needs of long term care patients and will certainly offer peace of mind for families while they wait. For example, St. Hilda's Towers in Toronto has a Safe Harbour program — and there are others like it — offering specialized care with specially tailored (sometimes personalized) programming, support, care and services. These will often be for a flat monthly fee, and if extra care is needed, this can be hired in or paid for, where the retirement residence has services available. Short stays (or respite care) offer an ideal solution for as long as required, until a proper long term care facility become available. Memory care facilities, for those with Alzheimer's and other dementias, are another smart temporary solution, while you wait for long term care. These facilities offer peace of mind and are an ideally robust solution for many people waiting for a bed to open in long term care. 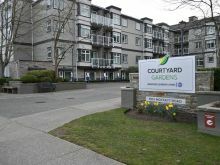 Families will try to get in to the facility of their choice by paying for residential care such as memory care or highly dedicated assisted living in that same facility. Long term care facilities are licensed and governed very differently from retirement homes, even though in some cases they may be closely affiliated with retirement residences and communities. Access to long term care is coordinated through government agencies in provinces across Canada. Retirement homes, for the most part, are populated with people who decide on their own (to varying degrees) that they need to move there. What are some distinguishing features of long-term care homes? Provinces including British Columbia, Alberta and Ontario fully fund medical and support services and residents pay only for room and board. Subsidies are available for those who cannot afford the full resident co-payment. Nobody is refused access on the basis of ability to pay. A mix of private, provincial, municipal, non-profit and charitable operators offer long term care. A personal "plan of care" is prepared for each resident and assessed every three months. The care plan can include clinical support services like regularly scheduled rehabilitation and social work services. 24-hour nursing and personal care is the norm, including access to a physician or other health-care professionals. Medication is administered by trained staff. Meals served can include therapeutic diets prescribed by a physician, and feeding may be included as one of various assistances available. 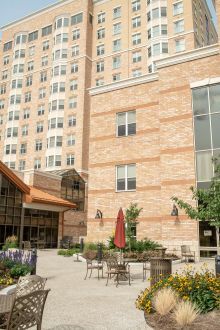 Various living arrangements are available to support residents with physical disabilities, mobility concerns, cognitive impairment, dementia and other assistive needs. Other assistance may be given with toileting, bathing, transfer, dressing and any other activities of daily living. Facilities often feature a shared or central dining room, TV room and other common facilities, such as lounges. Organized and regularly scheduled recreational and social activities are typical. Housekeeping and laundry services may include regular washing of bed linens, towels, washcloths and clothing. Call bell, intercom or emergency phone system are available in most facilities. Wheelchairs, rollators and other assistive aids may be supplied, if you require. Optional services (e.g. hairdressing) can be purchased for a fee in some care facilities, while other services and amenities can vary. Within the long term care industry, there is a spectrum of quality, availability and value of care. Some homes may be easy to get into (no waiting list) but these may be undesirable for other reasons. As with many things, there may be, unfortunately or inevitably, tiers to the system, and the old adage 'you get what you pay for' may be applicable. What should I consider when selecting a long-term care facility in Canada? When you have, or your loved one has, been assessed as needing long term care, and you begin your search, there are a number of factors to bear in mind. Ideally, you have discussed this before, either with the loved one or within your family, and you know where you want to go and you know what some or all of your options are. Unfortunately, this is not the case for many families, and the situation may be imperative. Any perceived urgency should never cloud your judgement, though; take time to explore your options as a fully as the situation allows for, or as you have time to. The quality of care offered varies from one facility to another, both within the realm of for-profit and not-for-profit sectors. When you check into the quality of homes, you may read reviews, which can certainly offer some helpful guidelines. Bear in mind, though, that some negative reactions may come from the fact that people's expectations of care staff and their abilities may be too high. Ideally, talk about preferences while your loved one's cognitive abilities are still intact. If your loved one is in the early stages of dementia, then get answers from them as soon as possible, when they are optimally lucid. Perhaps even record them, so you remember them later. Not sure how to talk to your parents about long-term care? Watch The Talk. On-site tours allow you to get a good "feel" of the community and range of services offered there. Take our checklist, add your own notes and questions. Bring a close relative or a friend — several sets of eyes are better than one. The home and its environs. Is the atmosphere welcoming? Did staff clearly explain their policies on important issues such as safety restraints and administering medication? Look beyond room size and decor, and consider the home's philosophy and mission. Who runs it? What is their approach? Does it gel with your own? Policies and processes. Is there a clear process for residents and their families to participate in care planning and delivery? Is there a clear process for contacting relatives in an emergency? Is it convenient for friends and relatives to visit? Is there a clearly defined process for registering and resolving complaints? Care of residents. Be mindful of the care exhibited for current residents. Do all of them look like they have had their basic care needs taken care of? Do residents have choices on such things as taking showers versus baths, when they go to bed or whether or not they choose to participate in activities? Did the residents look well-groomed and appropriately dressed? Rooms and suites. Take a good look at the rooms or suites and imagine yourself staying there. Return for a second look or arrange for a stay overnight if available. Taste test: stay for a meal or two. Do meals cater to residents' taste, cultural or religious requirements? Long term care is government-funded across Canada, so costs vary only slightly from one province to the next. Here's an overview. The above is simply a survey, taken from homes listed here at Comfort Life. You will need to consult with individual homes to learn exact costs and care offered. Fees cover room and board only. Costs for this are not prohibitive, as you see above. Consider that homes take care of all other typical household costs. If you are on a waiting list, and you want to get the best care possible for your loved one while you wait, consider typical means by which families pay for seniors' care. Your loved one may have had the foresight to purchase long-term care insurance, which can ease the burden of paying for a short term stay in a retirement home. Many homes listed here also offer palliative care. Palliative care focuses on the prevention and relief of suffering of elders who may have a terminal illness. Care provided may include therapies and medication, including pain relief. Find out more about the benefits of getting palliative care in a retirement residence. "The goal is to keep our residents physically, cognitively and spiritually active. We often have residents come up to us after an activity to say it was wonderful." These are still called "nursing homes"
Long-term care is the preferred term for communities that provide comprehensive personal, medical, and emotional support. That said, it’s more than just terminology. Nursing homes were places that operated, historically, within a specific model, often without attention to needs beyond those that were medically required. Contemporary long-term care residences have grown away from a hospital model, directly countering the clinical impression many people have. Communities strive to provide a variety of lifestyle options, health services and amenities to make every resident feel safe, welcome and fully supported through any challenges they may be facing. Staffing ratios are high, as is an attention to very personal, consistent care and companionship. There is a world of difference. Long-term care homes are part of our publicly funded and regulated health-care system; retirement homes are a housing option for seniors, and include independent living. Admission to a long-term care home is based on assessed medical need, while retirement living is often a matter of personal choice and resources. People sometimes move into a retirement home because they no longer wish to cook for themselves, drive, or live alone. The move into long term care is more likely based on medical requirements. With a regulatory framework that includes more than 400 care and service delivery criteria, unannounced annual inspections, a public complaints hotline and a website that identifies each home's compliance and complaint record, long-term care is our most heavily and publicly regulated health care service. Long-term care services are delivered by a team of health care professionals. The concept of home is pervasive. Residents and their families participate in care planning, and in the life of the home through resident and family councils. In Ontario, you can discover this reality from a variety of sources. These include Community Care Access Centres and the Ontario Ministry of Health and Long-Term Care website. As well, the website of the Ontario Long Term Care Association contains contact information for over 420 member homes and a checklist for consumers to help find the right fit in choosing a long-term care home. Most importantly, visit a long-term care home to see for yourself. Nobody is refused access to long-term care because of financial difficulty. A government subsidy, based on an income test, is available for residents unable to afford the full amount of the resident co-payment for basic accommodation, currently less than $50 per day. Compiled with the assistance of the Ontario Long Term Care Association (OLTCA), the Ontario Association of Non-Profit Homes and Services for Seniors (OANHSS: re-branded as AdvantAge Ontario, as of 2017), the Ministry of Health and Long-Term Care, and Statistics Canada.